To the right, Athaliah, mother of the recently deceased King of Judah, impassively watches soldiers slaughtering her sons' offspring so that she can become queen. The eventual restoration of the rightful ruler--a grandson who had escaped--brought an abrupt end to Athaliah's reign and her life. Medieval Christians often saw such Old Testament stories as prefigurations of New Testament stories with similar themes. In this case, the text on the page concerns Herod's order to kill all the male children of Bethlehem younger than two years old in the hopes of murdering Jesus. 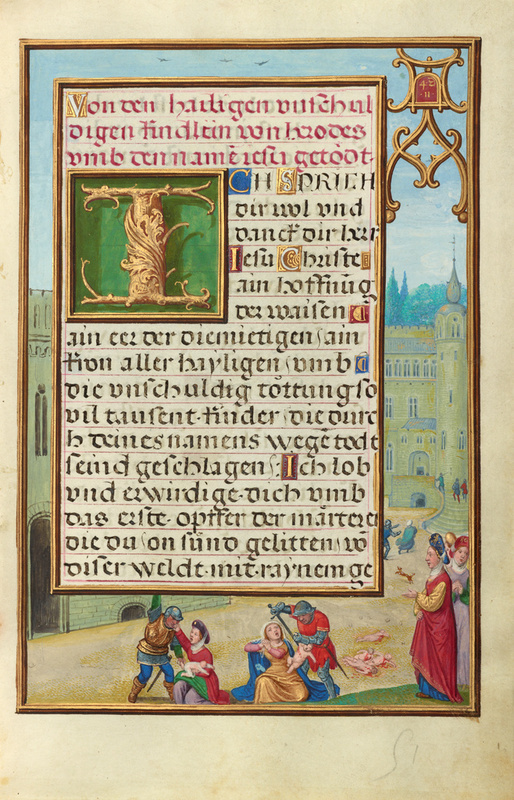 The miniature that would have faced this page, removed from the manuscript at some point in its history, surely depicted the Massacre of the Innocents.